Finger food recipes are always a hit! Soon there will be invitations coming in for holiday parties, and here's a simple appetizer that is good for you, quick to make, and it can be done ahead except for a little last-minute baking time. It's always a hit because the sweet and salty flavors are perfect together, plus finger food recipes are the best for easy clean up and for grabbing as you walk by the food! Good for you, you ask? Yes! Bacon, when purchased from a farmer you trust, who raises pigs out on pasture where they can forage around, is full of nutrients and the fat (lard) is, too! Read this post from Michael Pollan: The Source Matters. 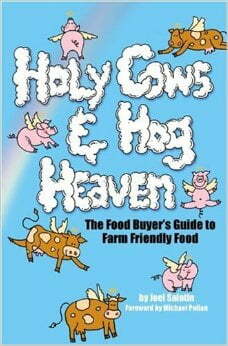 Or get this book by Joel Salatin: Holy Cows & Hog Heaven. Below you can watch a video with Joel Salatin where he talks about how he runs his pig operation. It's a beautiful look at his happy hogs, as opposed to the sad, disgusting environment that factory farmed animals are raised in. Conventional pork is not good for us. By the way, lard (from pigs) and tallow (from cows) are my two favorite frying fats. Here's where you can get lard if you don't have a local source and I love this big tub of beef tallow – I priced it and it was even cheaper than when I rendered it myself! (If it's out of stock, it should be back soon.) 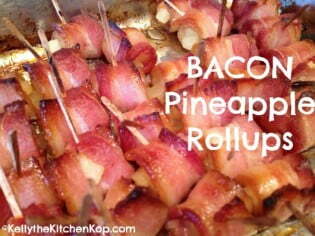 Have you seen my recipe for Deep Fried Heaven? This is a simple appetizer recipe that can be made ahead of time and popped in the oven before your company arrives. Be sure and make a bunch! These things always go fast! 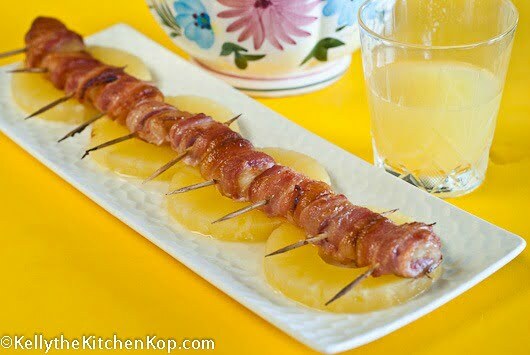 Wrap uncooked bacon around the pieces of pineapple and hold it together with a toothpick, set them in a 9 x 13 baking dish. Drizzle a little of the pineapple juice on top and a little real maple syrup. I also sprinkle on some organic palm/coconut sugar or organic granulated sugar – the more sweetener you use, the more caramelized it gets, but even with a light amount it's still really good because the pineapple is sweet, too. Bake 375* for 30 minutes until hot and caramelized. I like it almost burned, but not quite. Need more appetizer ideas? Check out my Appetizer and Dip recipes here. These are delicious! I took them to three different parties this Christmas and every time they were a hit. Though I once used canned pineapple, and a separate time I substituted coconut sugar instead of maple syrup the results were still heavenly, and delightfully simple for me to throw together. My suggestion would be to use two packages of bacon (though expensive) in order to have a full presentation on a platter. Thank you for sharing this recipe; it made my Christmas season much less stressful. With all the attached articles I am finding this to be one of the best posts for me I have read of yours to date, Kelly. We soak any pork for several days to a week in whey per WAPF suggestions. @Stephanie – does this change the taste, soaking it for so long?